Nests can bring an outdoor texture into your home. 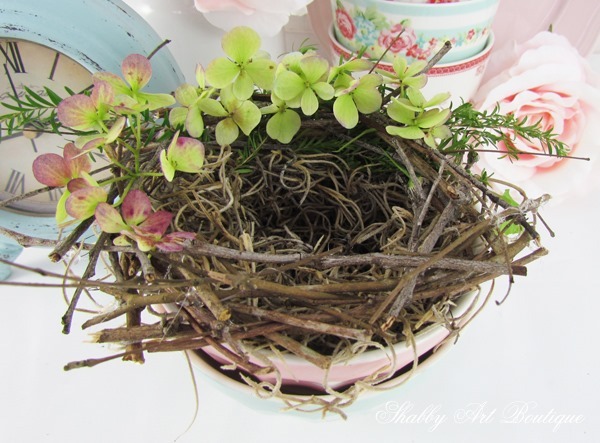 Nests are easy to make and you can get creative to coordinate with your decor. 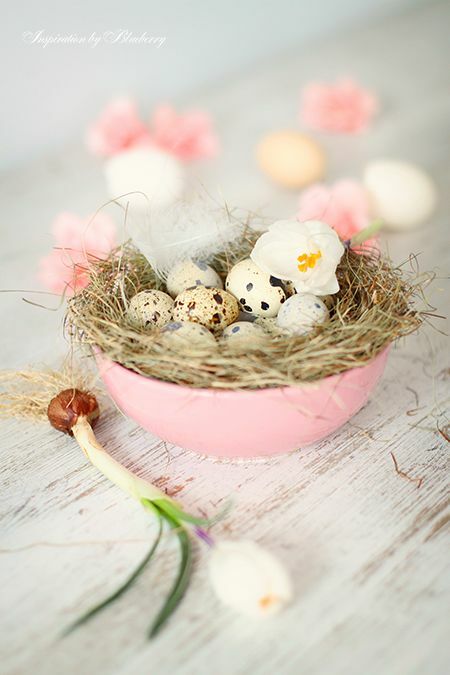 Keep it simple with just some moss or add dried or artificial flowers, eggs, berries, ribbon or twine. Your craft store has a lot of choices in the floral aisle. My instructions for making decorative nests are below, but I’ve also included a few links with other pretty options. My handmade nest in the sun. I grabbed a bag of mixed moss and earthy stuff. Samples of materials for a handmade nest. You’ll see in my pictures that I am working inside a plastic container. These dried materials can get messy, so be sure to put down paper or something to work on that can be easily tidied up when you are finished. I partially wrap the ball with aluminum foil. This way if your glue sticks to the foil, you can easily pull it off of the nest. Partially wrap the ball with aluminum foil. Start adding spanish moss to the more than half of the covered portion of the ball. Glue the moss to the moss. Just a little bit of glue each time you add to the nest. Start adding moss with dabs of glue. Add more moss on top of the moss with dabs of glue each time. You’ll see it starting to fill in and take shape. More than half of the ball is covered, but not completely covered. After you have added and glued enough moss so that you cannot see the aluminum foil, through your moss, carefully remove the foil with the nest still attached off of the ball, be sure to keep the rounded ball shape. Carefully remove the aluminum foil with the nest still attached. Carefully remove the aluminum foil from the inside of the nest. If necessary, add more moss with more glue to fill in. Hand-shape the nest to complete the form. Voila, you’ve made a nest. 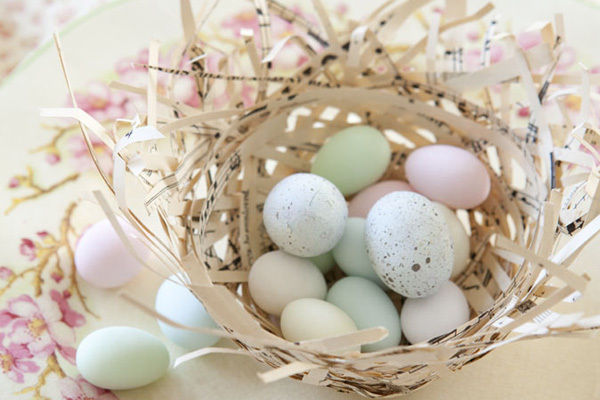 If you’re done, just add a birdie or your eggs and put it somewhere special. Add your special touches to your nest. Remember, I also bought a bag of mixed mosses, so I’ve glued in pieces of those to add some color and new textures. I’m going to use this nest in a wreath so I’ve also used a couple of bits and pieces of artificial berries and flowers. You’ll also see I’ve added a little yarn and twine. My handmade nest with moss, berries, flowers and twine. My handmade nest with two birds on a silver platter. Have fun and get creative. No rules, it’s your nest. Make it how you want it. Tuck your nest on a bookshelf or in a cabinet. These are a pretty addition to winter decorations or on your Christmas tree. 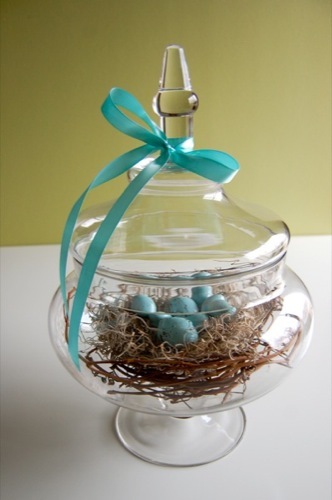 Make a line of nests down the center of a table for wedding centerpieces, or add colorful candy for spring gatherings. My handmade nest with ivy, berries and moss.